Posted January 22nd, 2013 by holec. Machine Learning is increasingly becoming a technology that directly interacts with human users. Search engines, recommender systems, and electronic commerce already heavily rely on adapting the user experience through machine learning, and other applications are likely to follow in the near future (e.g., autonomous robotics, smart homes, gaming). In this talk, I argue that learning with humans in the loop requires learning algorithms that explicitly account for human behavior, their motivations, and their judgment of performance. Towards this goal, the talk explores how integrating microeconomic models of human behavior into the learning process leads to new learning models that no longer reduce the user to a “labeling subroutine”. This motivates an interesting area for theoretical, algorithmic, and applied machine learning research with connections to rational choice theory, econometrics, and behavioral economics. Thorsten Joachims is a Professor of Computer Science at Cornell University. 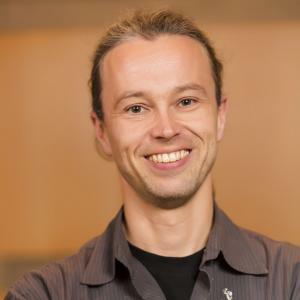 His research interests center on a synthesis of theory and system building in machine learning, with applications in language technology, information retrieval, and recommendation. His past research focused on support vector machines, text classification, structured output prediction, convex optimization, learning to rank, learning with preferences, and learning from implicit feedback. In 2001, he finished his dissertation advised by Prof. Katharina Morik at the University of Dortmund. From there he also received his Diplom in Computer Science in 1997. Between 2000 and 2001 he worked as a PostDoc at the GMD Institute for Autonomous Intelligent Systems. From 1994 to 1996 he was a visiting scholar with Prof. Tom Mitchell at Carnegie Mellon University.